Conferences were a staple of my first several years in ministry. You know the kind- bright lights, fog (is fog a thing anymore? ), everyone is really amped up about life and Jesus and ministry. And at these gatherings, specifically for those of us in youth ministry, the message was as loud as the chorus of “How Great Is Our God”: Youth Ministry was a calling, not a stepping stone to something else. Those of us in the room weren’t like those other people, the ones who viewed working with students as a short stop on their way to something bigger and better. No, we were in it for the long haul- we were the real deal. I’m pretty sure these messages were intended to encourage those of us in the trenches of youth ministry- after all, working with teenagers is hard and holy work. We could all make a long list of jobs that would be easier (and pay better!) than student ministry. And as a student pastor in a small and often challenging church, I needed to know that this calling was worth fighting for. For me, there was a shadow side to this narrative. The quiet but insistent voice that there was a right way and a wrong way to do ministry. Those people who moved from student ministry into something else? They were giving up, viewing youth as a blip on a map, not the destination. The right way- the faithful way- was to commit to students for the long haul. Anything else was quitting, and my stubborn self was not here for that. Six years ago, standing in that tiny church office in Pasadena, I never could have painted this picture of my future ministry and calling. None of it- starting small groups for busy families, visiting older volunteers in the hospital, wearing a robe while assisting in worship, leading teams of people who are old enough to be my parents- not one single bit fit into the box I carried with me. And being open to what God could do outside of what I considered the “right” way to do ministry has been so freeing. It’s been exciting. It’s been challenging. And it’s exactly where I need to be right now. I’m still as stubborn (hopefully slightly less rant-y) as I was six years ago, it’s true. What’s really changed is that now my regular prayer is not that I will do ministry the “right way”, but that I can hold my calling much more loosely, and be able to trust that God is probably leading me somewhere I have never been before. Where this call will take me next, I don’t know- but I do know that getting there is a holy adventure and I’m all in. 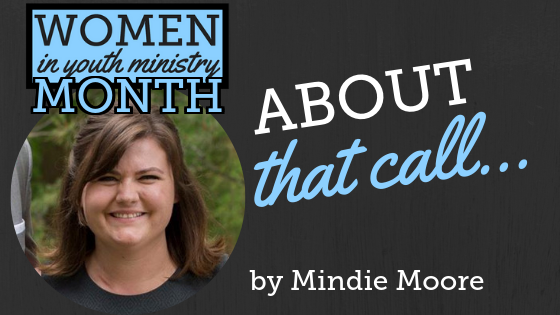 ABOUT MINDIE: Mindie Moore is the Director of Groups and Young Adult Ministry at St. Luke’s UMC in Indianapolis. She loves her husband’s home roasted coffee, travel, and is currently reading an incredible amount about being Methodist as she works toward ordination as a Deacon in the UMC. Besides full time ministry, her greatest work is raising up two incredible red haired children. Say hello on Instagram @mindiemo429 or feel free to reach out via email at moorem@stlukesumc.com.